Samsung Galaxy Note 7 will be launched on August 2, confirmed the South-Korean company in a new blogpost announcing the big release. Leaks and rumours had indicated the Galaxy Note 7 will launch on August 2, and they got the date right. Samsung Galaxy Note 7 will be the new smartphone in the Note series, and the company is technically skipping a number in this generation. While the previous version was Note 5, Samsung has gone ahead and confirmed the upcoming edition will be called Galaxy Note 7, not Note 6. This also means the Note 7 is more in line with the names of the new S7, S7 edge flagship and actually makes more marketing sense for the company. 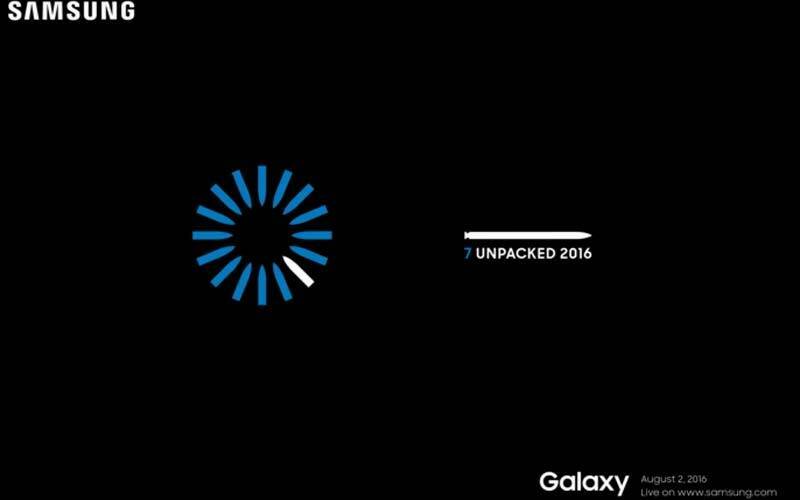 Samsung in its blogpost announcing the date, gave reasons as to why the new phone is called Galaxy Note 7. The post reads, “First, the Galaxy Note7 will complement our Galaxy S7 and S7 edge, and unify our product portfolio. Second, the Galaxy Note7 will minimize confusion about the latest mobile technology from Samsung, and provide full alignment with Galaxy S smartphone.” The Note 7 name was also leaked earlier, so that’s another thing the rumour mills have got right. Samsung Galaxy Note 7 launch will take place in New York at 11.00 am EDT (8.30 pm IST) and the company will host simultaneous launch events in Rio de Janeiro at noon and in London at 4:00 pm. The Rio launch is not surprising; Samsung has even announced a special Olympics edition Galaxy S7 edge smartphone. Samsung Galaxy Note 7 specifications were recently leaked on the AnTuTu app, which showcased a version with 4GB RAM, Android 6.0.1 Marshmallow, 5.7-inch QHD Super AMOLED display,12MP Dual Pixel rear camera plus and IP68 certification. It also reported that Samsung Note 7 will include a bigger 4000 mAh battery. One of the criticisms in the Note 5 was that Samsung reduced the battery from 3,600 mAh to 3000 mAh. Samsung Galaxy Note 7 is also rumoured to feature an Iris scanner, and the dual-edge display technology seen on the Galaxy S7 edge. We’ll have to wait and see what Samsung unveils on August 2, but there’s a good chance the leaks will continue to reveal more about the upcoming smartphone.